Why does American Airlines Hate America? I was watching KPLR (Ch. 11) last night and they did a story on a National Guardsman (I think his name was James Ditter, but I may not have heard correctly)who returned home from Iraq only to find that he had lost his job as an airline mechanic for American Airlines. American Airlines claims they had a contract with the union to lay people off based on seniority, so they really had no other choice but to lay off the National Guardsman. Even though laying off someone on active duty is against the law! I have checked KPLR’s website but they don’t mention the story. During the story it was mentioned that Charlie Brenann of KMOX radio had done a story on it, but I couldn’t find any mention on Kmox’s website. I also checked the Post-Dispatch and Kmov’s websites to no avail. If the story is true I think it is really heinous. After serving in Iraq and risking his life every day he has to come home and be unemployed. I can’t imagine how horrific war is and it it has to bee tough leaving that kind of situation and trying to go back to a normal life. It is even worse when you come home to no job. This is just not right! I Discovered this site on Pharyngula. 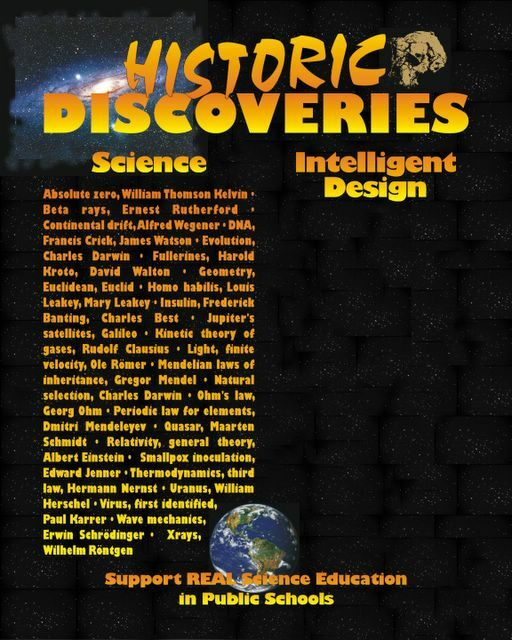 Keep updated on the Kansas Evolution Controversies and get a great poster comparing the discoveries of science with the “discoveries” of intelligent design. The St. Louis Post-Dispatch, on 1/21/05, reported on a recent article in the journal Science. The article, in the Post is Volcanic heat gets blame for extictions. The extinction event occured approximately 250 million years ago. In the event 90-96% of all species and 50% of all families went extinct. This includes 8 of 17 insect orders, 21 of 27 reptile families, 6 of 9 amphibian families and 70% of all marine invertebrate genra – including all reef building coral. There is some evidence that indicates that this may have been two separate extiction events separated by about five million years in time. There are several different theories as to the cause of the event(s) divided into three general areas. 1)Changes in oceanic chemistry and sea level. There is some evidence that indicates a major regression (drop in sea level)event related to the formation of the supercontinent Pangea. Along with this there is some evidence of a short term cooling trend, which may have lead to anoxic conditions in ocean bottoms (due to the shallowing ocean caused by the regression). The cooling temperatures would have lead to overturn (the cooler waters at the ocean top sink forcing anaxic water to the surface) killing most of the shallow water forms such as articulate brachiopods off. In general, the extinction event affected those species with narrow geographic distributions more than those with broad geographic distibutions. 2) Changes in atmospheric chemistry and climate. There were several different interlinking causes. During the Permian there is evidence of a strong warming trend. There is also evidence of increased volcanic activity (in the siberian flood basalts, for example).This volcanic activity released massive amounts of sulfer dioxide into the atmosphere creating a “volcanic winter” or short term cooling trend which led to the above mentioned overturn in the world’s oceans. One byproduct of the overturn was to release massive amounts of carbon dioxide into the atmosphere which reinforced the warming trend. With that in mind, the paper summarized in the Post attributes the extinct event to global warming and oxygen deprivation. The article also finds that there was a gradual extiction for about ten million years followed by a raridly increased extinction rate for another five million years. According to the paper the oceanic regression at the end of the Permian exposed massive amounts of oceanic sediments to the atmosphere, which caused a massive emission of carbon dioxide and methane – two greenhouse gasses. This reduced the diluted the amount of oxygen in the atmosphere from 21% to 16% or less. Since oxygen concentration decreases with increasing altitude this dilution of oxygen would have reduced living space by up to one half. According to the authors only those species living at the oceans surface would have survived. As we saw above, however, most of the species living at the ocean’s surface went extinct. Finally, the authors say that since there was a low oxygen environment, evolution would have favored those organism adapted to it and hypothesize that dinosaurs were adapted to a low oxygen environment. They point out that birds (the decendents of dinosaurs) can live at low concentrations of oxygen. I’m not convinced by this last. Dinosaurs evolved and went extinct over the 190 million years following the Permian. Presumably, the oxygen content would have increased back to 21% and dinosaurs would have adapted to that. Granted, birds can tolerate lower oxygen concentrations but what this means to me is that they evolved to tolerate a wide variety of oxygen concentrations rather than that they adapted to low oxygen concentrations. I should also point out that I have based this on what I read in the newspaper, rather than the paper in Science – which I haven’t had a chance to read yet – so I’m not sure about the accuracy in the Post article.